The administrative area of Cumbria was created in 1974 by the combining of the ancient counties of Cumberland and Westmorland together with part of North Lancashire (Furness, or Lancashire over the Sands) and, in the east, part of the West Riding of Yorkshire. To the average visitor Cumbria means the English Lake District, a land of mountains, valleys and water. Many would be surprised to learn that they are surrounded by, and indeed have beneath their feet, a large number of remains of once thriving industries. Whilst the visual impact of quarries is obvious, the effect on the landscape in Furness by years of coppicing of the woodland is less apparent. The area has a mountainous core of three main forms of rock. Skiddaw slate in the northern area around Keswick, and outcropping at Black Combe in the south-west; Borrowdale volcanic in the central massif which includes the highest mountain in England, Scafell Pike at 3210 feet (977m); and the Sulurian slate of the Windermere and Coniston areas. A narrow band of limestone crosses the area from Shap to the Duddon estuary. From earliest times rock has been worked by man. In the Neolithic age stone axes were produced in Great Langdale in large quantities. Quarrying was started to satisfy local demand and expanded to supply further afield and abroad. 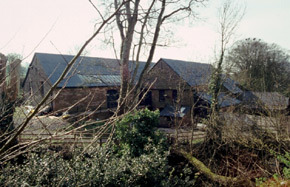 The presence of limestone ensured a lime-burning industry and the building of numerous kilns in the south of the county. 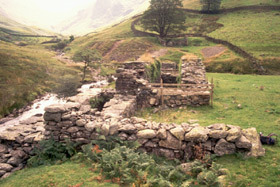 Beneath many fells mining took place to win principally copper and lead. The high fells have from monastic times been sheep runs providing wool for cloth making and in the east for the hand-knitting industry. To the north, west and south the land falls from the uplands to fertile coastal plains where, after forest clearance, agriculture became the main industry. The coastline holds four major and several smaller river estuaries, and shipping and fishing developed as did shipbuilding in a number of locations. In two coastal locations, one in the south and the other in the north-west, large deposits of iron ore were found and subsequently mined on a large scale. Also in the north-west an extensive coalfield was discovered and led to the development of Whitehaven and Maryport. In the south of the county a number of woodland related industries arose including coppicing, bark peeling, besom, swill and hurdle making, and charcoal burning. Apart from the beauty of the area the Lake District is renowned for its rainfall. The head of the Borrowdale valley, near Keswick, has the highest recorded precipitation in England of up to 200 inches (5000mm) a year. The vast amount of moving water has been harnessed from medieval times, originally by water wheels, the first ones driving corn and fulling mills. This abundance of water power and availability of raw materials, either locally or easily obtained, led to the proliferation of industries which included textiles, woodworking, iron forging, paper making, marble polishing, comb making and blacking manufacture. In 1764 the manufacture of gunpowder commenced in the Kent Valley. This was a major industry, and most of the black powder in use in the country came from Furness and Westmorland. Water power was readily available. Of the three raw materials charcoal was also available locally, saltpetre came from India, then Chile and at one time from Germany, and sulphur was imported from Sicily. The traditionally made charcoal was often contaminated with soil, stones and bark so cylinder retorts were brought into use. 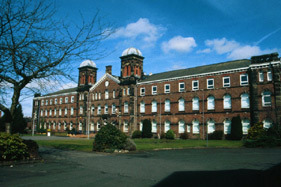 There are very few remains of the sites as the mills were all required to be destroyed by fire after closure. Tobacco was imported through Whitehaven and carried by pack pony over the fells to Kendal. This method of transport resulted in some damage to the fragile loads and the broken stalks and leaves were used to found the snuff industry. Transport and communications have always been a problem due to the wide estuaries in the south of the county and the mountainous centre. The Romans first tackled the problem as they required supply routes between their 23 forts, and so built the first paved roads. In medieval times some Roman routes remained in use but many new ways were created between settlements, usually just as tracks without formal maintenance. In the mid eighteenth century turnpikes were constructed. Three canals were built in the county. A short one at Ulverston was to provide a safe harbour from the Leven estuary. The Lancaster canal reached Kendal in 1819 and stimulated industrial growth by allowing the importing of coal and the exporting of slate and lime. The third canal from Port Carlisle was short-lived and soon converted to a railway. The first major railway in the county was the Lancaster and Carlisle opened in 1846. By 1857 various small railway companies had joined to form the Furness Railway along the coast. The growth of railways encouraged tourist traffic and the building of large hotels at Grange, Keswick and Windermere. More importantly it led to the growth of slate and mineral extraction due to the ease of exporting produce. The building of the South Durham and Lancashire Union Railway allowed coke from Durham to be brought to the iron furnaces of West Cumberland. In 1880 some 40 furnaces were in blast, now all obliterated. Quarrying is still viable with, for example, the Burlington company shipping slate all over the world. Mineral mining finished with the closure of Force Crag mine near Keswick, coal mining with the closure of Haig Pit at Whitehaven. Shipbuilding continues in Barrow, mainly submarines but with a current run of surface vessels. The woodland industries survive in the hands of a stalwart few and snuff is still made in Kendal. Industrial activity thrives at various locations – paper, chemicals and nuclear fuel are produced, limestone and gypsum quarried and mined – although the main industry in terms of employment must be tourism!